Barring an extension, last Tuesday was the deadline for filing your tax returns - for most of us, an unpleasant task if there ever was one. One return date that is welcome, though, is Appetite for Awareness. 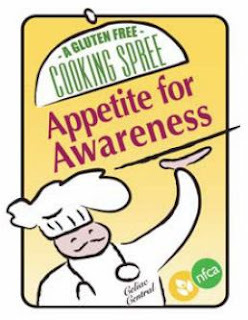 The signature event of the National Foundation for Celiac Awareness will take place on Sunday, September 23 at the historic Strawbridge & Clothier building at 801 Market Street in Center City Philadelphia from 1 p.m. to 5 p.m. I'm proud to share the news that I will be honored at this year's event. As in the past, a highlight is the Gluten-Free Cooking Spree, where the city’s top chefs work with local physicians to serve their creative gluten-free dishes. There will also be cooking demos in front of the Grand Staircase, a Children’s Pavilion with kid-friendly gluten-free food and activities, dozens of vendors, a Beer Garden with flat-screen TVs to watch the day's sporting events, and the opportunity to win a one-year Mercedes lease. (You can read my recaps of the 2009 and 2010 events.) Guests can also participate in an attempt to set the record for the world’s largest gluten-free Rice Krispies Treat. For one admission price, you'll have unlimited gluten-free food and drink and a reusable shopping bag to take all of those free samples home. Early-bird tickets are now available and are $50 for adults, $25 for students (ages 12 and up) and $20 for children ages 5-11. A discounted family package (two adults and two children) is $125. (The cost of admission may be tax-deductible as a charitable donation; check with your tax advisor.) Non-discounted tickets will be sold at the door. At the same time, you can also purchase raffle tickets for a one-year lease of either a 2012 Mercedes GLK350 or C300. The venue is easily accessible via public transportation and there is free on-street parking in nearby Chinatown on Sundays. Congrats on getting recognized at A4A! Well deserved! You have been such an amazing resource for those with gluten intolerance. I look forward to seeing you in September!